Some notes, thoughts and loose ends on the cobbled classics once the dust has settled. The sheer entertainment of it all. From the Omloop onwards so many of the race came alive a long way out from the finish line. Prior to this the early season races like the Dubai Tour or the Tour Down Under have their role but for viewers it’s often only worth tuning in for the last 10 minutes. 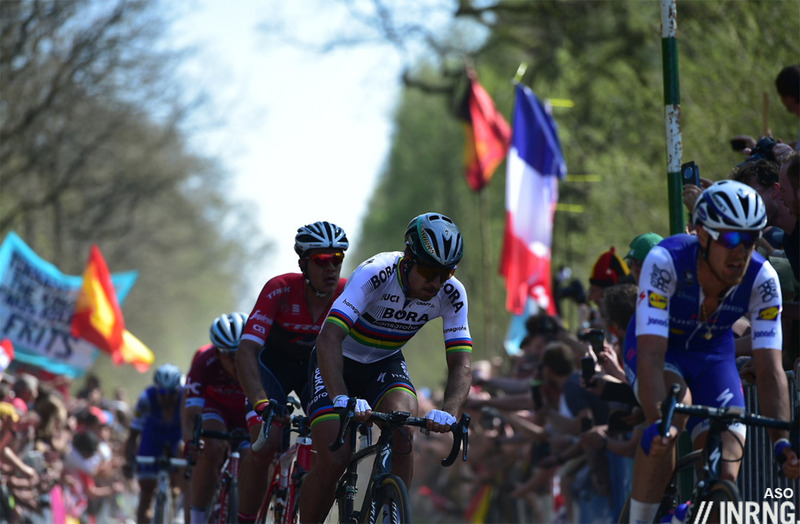 By contrast the cobbled classics – not Sanremo – saw the big names launching moves with 50km to go and in the case of Paris-Roubaix we had big dramas with over 100km to go and Peter Sagan was himself attacking with 77km left. It’s par for the course but seems heightened this year by teams looking isolate and tire Sagan. Second it’s a period of rituals and habits that are all closely choreographed, for example the recon rides done by teams in the days before a big classic where the media show up to film and photo it and even write it up. There are regular pre-race interviews, teams stay in the same hotel they did last year and even the rain avoids for Paris-Roubaix. Another annual event is Peter Sagan being isolated. It was a problem ever since he became a force in the classics when riding for the now defunct Liquigas team but now it’s his problem. He’s on a reported €6 million at Bora-Hansgrohe and surely on the most top-heavy team as measured by the ratio of the star rider to the team budget. If Sagan wanted he could personally spend some of this to hire in more help, a million Euros could hire the likes of Daniel Oss and Oliver Naesen and leave change spare. However the likes of Marcus Burghardt and Maciej Bodnar offer precious support, they were just undone by punctures at the wrong moment, some things money can’t buy. One solution would be to merge Quick Step with Bora-Hansgrohe with Specialized as the matchmaker. 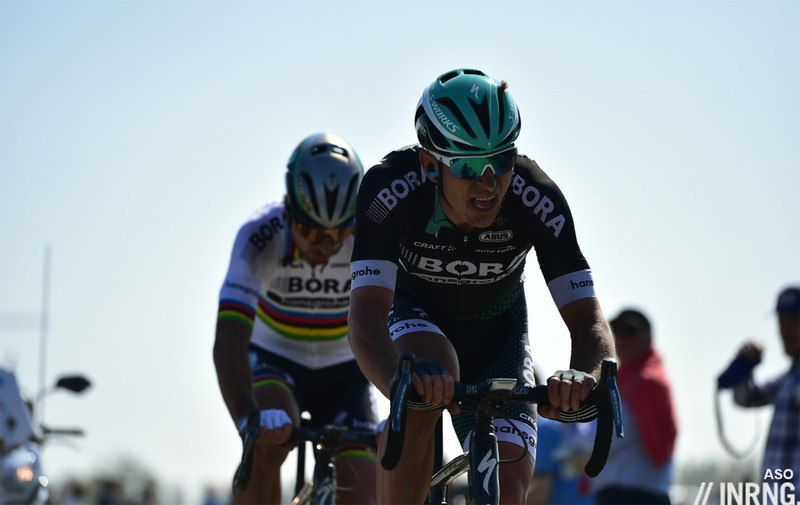 Of course it’s not going to be 1+1=2 because there’s a cap on the maximum size of the team of 30 riders but it’s a thought to be entertained given Bora-Hansgrohe are a relatively weak team and Quick Step want a sponsor. …much like the polemic over riding on the pavé or the path. One unsaid thing was that riding on the side of the road is still technical – you can fall as we saw on the Kwaremont and go back to see Sagan on the Koppenberg, he was so close to the barriers he was weaving his upper body around spectators – and also that this narrow space lines out the riders, instead of a bunch across the road it’s single file and this lines out the riders, hampers overtaking and prompts selections. In other words using paths or the soft dirt edges of the cobbles is part of the race whether the UCI can or can’t do anything. One rider no longer worrying about a contract is Tom Boonen who certainly delivered Quick Step their money’s worth in terms of publicity. His retirement had spectacular coverage in Belgium and included plenty of marketing for his sponsors yet it never felt excessive or forced. There’s no new Boonen but the rapacious Belgian media have plenty of riders to write about. Greg Van Avermaet and Philippe Gilbert can deliver big wins but both are in their thirties. What can they do next? Within minutes of winning the Ronde van Vlaanderen after a solo 55km breakaway Gilbert was being asked on television whether he can win other Monument classics. Ditto Van Avermaet who can read a long list of races he needs to win in the Belgian press. Does this happen in other sports, does Usain Bolt win the 100m and immediately he’s asked whether he fancies his chances in the 200m and 400m, does a Wimbledon tennis winner face instant questions about whether they can win it again the next year? Cycling does this alot, no sooner did Sagan start stringing together green jerseys and people started asking what he could do next; once Chris Froome wins the Tour de France it’s quickly a question of how many more editions can he win. It’s normal to ponder on these questions but we seem to pose them before a rider has cooled down from a big win. I wanted to do a piece looking at the revelations of the spring classics but it would have come with more buts than ashtray. For example Oliver Naesen (Ag2r La Mondiale) had a great spring… but he’s already won a World Tour race in the Bretagne Classic (ex GP Plouay), was second in the Eneco Tour last year and generally many were excited to see what he could do this spring. The same with Gianni Moscon (Team Sky) who was impressive in Paris-Roubaix… but he was good last year too, winning the Arctic Race of Norway. The results breakthrough came from Yves Lampaert who finally won a classic with the Dwars Door Vlaanderen, a relatively small win but often a stepping stone for greater things but again no revelation, he was top-10 in the Worlds time trial in Doha last year and a fixture of the Quick Step team. Luke Durbridge went up a level, Arnaud Démare’s sixth place in Roubaix was good for a 25 year old, Jasper Stuyven’s improving but won in Kuurne last year and Dylan Van Baarle’s already won the Tour of Britain and was sixth in De Ronde last year. Similarly you could do a “flop” piece but this is a bit cruel, it’s not like any riders decided to aim for poor results but there were riders who could have been part of the cast of characters but they faded away. Sep Vanmarcke’s injuries come to mind, another missed season for him. Team Sky were quiet on the cobbles – Ian Stannard’s highest place this spring was 14th – and Lotto-Soudal’s hopes rest on Tim Wellens in the Ardennes after another quiet cobbled campaign but suddenly Tiesj Benoot appeared in today’s Brabantse Pijl. Lotto-Jumbo, Movistar, and Dimension Data didn’t show that much either. It makes you wonder about the point of the World Tour. Of course 18 teams can’t be competitive across all fronts but compulsory attendance just seems punitive with some teams forced to send diminished squads just to make up the numbers. It’s been said that Philippe Gilbert’s contractual situation is a huge motivational force, that because he’s on one year deal with Quick Step he’s got to prove himself and this has led to the impressive results. It’s plausible but surely he was in the same place a year ago when shopping around for a new team? Only the results were not as impressive. It’s probably a combination of factors, one is he’s simply racing on terrain that suits him, he’s 34 now and maybe he’s lost some of that famous jump, instead he can put out longer power so he’s better suited to big breakaways rather than searing attacks? Another is his contract which provides a reduced salary but big win bonuses, so it’s not so much the need for a contract but the direct results. Elsewhere one interview with L’Equipe implied he’s happy with the team ambiance, he’s a practical joker sometimes and BMC were too serious for him so that’s another hypothesis. Another is just sheer strength of his team, he can go up the road in Three Days of De Panne or De Ronde and the chase behind is blocked by his Quick Step colleagues. Gilbert is bound to be hot property, only will he move? Certainly some teams were invisible in the cobbled classics, probably the only time UAE-Team Emirates were noticed was when the police spotted Andrea Guardini riding along the autoroute after bailing in Paris-Roubaix. Bahrein-Merida’s Sonny Colbrelli was up there in the results from time to time but maybe they want more. Neither team was expected to shine but they’ve got rich backers and will surely be shopping for new names. One thing that’s easy to take for granted but should be celebrated is the quality of the TV coverage from solid signals to pacey production, a contrast to the persistent picture break-up seen in, say, the Tour of the Basque Country. The use of cameras in team cars adds something but it feels like the the staff know they’re on TV and it only really comes into its own when a rider wins or crashes out, such a definitive moment finally prompts drama in the car. As ever following the local coverage is even better because they have reporters on motorbikes able to comment on what is happening at the back of the bunch when the TV doesn’t pick this up. Did you watch Paris-Roubaix from start to finish? A reminder that every Tour de France stage will be live from start to finish too. This is great news but different, it’s one thing to have a race know for its action live on a Sunday but for three weeks? Some thought and selection will need to go into viewing habits. ” It makes you wonder about the point of the World Tour. ” – a question I’ve been asking since “Heinie’s Folly” was first introduced. Big +1 on that. A handful of tweaks need to be made before that system will work successfully (as it was intended). Revenue for the UCI is the sole purpose of the WT. The WT has NO competitive purpose. Organizers should be allowed to chose the teams for their event, and teams would benefit by not subsidizing the UCI with sponsors money, for which there is no return. Note the UCI doesn’t earn much money from the World Tour though. Each year I take a look at their accounts and do a blog post on it and it’s a small sum revenue wise compared to the Worlds, Olympics etc and even smaller in terms of net income after their costs and expenses. Difficult to get a precise figure, but in round terms 1 million $s gross from WT teams. Not an insignificant sum for an organization like the UCI. The effect is to reduce each team spend by around 56.000 $ dollars per year. For the smaller teams this is not an insignificant figure. Well, there’s money accounted through the UCI and then there seems to be money that “leaks,” millions at a time. Great piece as usual – on one point I respectfully disagree. I don’t think it’s more common in cycling than other sports for an interviewer to immediately ask the winner: “how many more/what else can you win?” This has irritated me for years and my hackles raise every time. I have heard it asked of Roger Federer,Tiger Woods, Chris Froome and Usain Bolt (upon breaking the world record). It is lazy journalism, it’s so annoying because the answer would never be satisfied, if Usain ran 200m in 2 seconds it would STILL be “how much faster?”. Journalism loves a narrative. It seems its become especially important in these days of clicks and advertising revenue, to have quotes to turn into stories. It seems more prevalent in the “news”-based area, rather than in longform journalism like here, and it’s partly why I come here actually. You see it in F1 all the time – everything is part of the bigger story, journalists try and stir things up, manufacture “beef” between drivers even if there isn’t any. See also; football. We know they all text each other afterwards and drink together and so on, but that doesn’t sell papers. It’s not just the journalists the love a narrative, it’s the fans too. Watching Leicester City win a match last year wasn’t that thrilling, doing it in the context of a 5000-1 chance at the league title made it more exciting. That’s surely the point of the world tour, trying to build a context. The frustration (and the beauty) of cycling is that you have different types of riders going for different objectives. In that regard the World tour doesn’t really work – but does it mean they shouldn’t even try… making those races non compulsory feels like a step backwards, like they were giving up on the idea of that season long narrative. It would create a world less about the teams and more about the individuals. Regarding your last paragraph and viewing habits; having the TDF be broadcast from start to finish will reveal the ever precious 1st hour of the race that is often alluded to in interviews but we never get to see. So we’ll witness the flurry of attacks, the 50+kms being covered in the first hour, and perhaps knowing they’ll be on TV the battle will be that much fiercer. It’ll certainly enrich the spectating process, with Prudhomme eyeing the potential advertising $$ that’ll certainly come with the introduction of the first paces of each stage. More importantly, the dynamics of the race might change once the riders know they’ll be on TV for that long. Maybe for the better? who knows. We’re yet to witness another development in the commercial exploitation of our sport but in the end I see it as positive. Great post as usual, thank you. All true when it happens but on the flat stages in the Tour de France it’s been almost choreographed with a handful of wildcard teams sending riders up the road in a no hope move, they get no more than four minutes and it’s a certain sprint finish. It’ll be interesting to see if the TV alters this, as if knowing there’s airtime around the world increases the value of the breakaway a bit? Full live coverage should be good for the livelier stages though. And the hair on his head and his horse’s matched. Saying ‘Wanderer, know you are welcome here. And we may learn in a little while what you would like’. ‘So help me God who sits on high’ he said. ‘No. It is not my purpose to pass any time in this place. if you’ll grant me the right to give as good as I get in play. But later is soon enough, a full year and a day. The reason I visit this website? Hereabouts they quote poetry! “…for viewers it’s often only worth tuning in for the last 10 minutes.” That’s pretty much all the Ardennes races too. Yeah, they’ve changed up the finish of Amstel, so it will probably be a bunch sprint rather than a reduced one. A Bora-Quick Step merger might make sense, but you’d get an even more extreme version of the “too many cooks in the kitchen” dilemma that has probably cost QS wins of late. One potentially interesting future note is Alexander Edmondson who lead home the Sagan group at Flanders in 25th position on his first attempt at the race. He won the under-23 Ronde in 2015, and while U23 form doesn’t always translate, his could be a name to watch. Yeah, you’re probably right. But every time I hear something like this, I immediately think of HTC-Highroad; the winningest team with some familiar talent at the time they couldn’t find a sponsor: Mark Cavendish (Road World Champ, 5 TDF stges + green jersey), John Degenkolb (Dauphine stages), Bernie Eisel, Matt Goss (MSR), Tony Martin (ITT World Champ, TDF, Vuelta; Paris-Nice), Marco Pinotti (TTT Giro + a day in pink), Mark Renshaw (Cav lead-out, Qatar GC), etc. All true but did they ever have a real sponsor? When T-Mobile/Telekom pulled out in embarrassment over the repeat doping scandals they paid a lump sum to the team which helped keep them afloat for years, the likes of HTC and Colombia sponsored the team but at reportedly below market rates, often very below. So the team were never adept like Patrick Lefevere at finding sponsors to fund the team. The co-sponsor was Columbia, not Colombia, the land of Quintana, Chaves and Uran. in other words he’s pulling his usual tactic of negotiating via the media. It did get him some good deals in the past so I wouldn’t give up the team too early. Paris/Roubaix start to finish? Yes, and loved it. But then it’s a race which, by its nature, can and does serve up drama at any moment. Things that happen early often profoundly affect the result. Overall I have enjoyed the spring classics more than ever this year, and am looking forward to the Ardennes. Your excellent columns only serve to enhance my enjoyment. Many thanks. Me too, the lack of breakaway was fascinating. Sorry to be pedantic and, as usual, wise observations IR. Maybe some day the video technology and coverage will progress to remote controlled drones operated from follow cars/motorcycles, providing a unique view of the race as well as not providing a draft advantage. The drones. the drones, the great white tech hope. Have you ever compared a drones ability to a motorbike? Especially on a 250km race? Where are your drones in wind an rain, where are they after a short time, when their battery is out of power. where are the operators of those drones? Riding on motos behind, with no real clue what’s going on.? good luck with that. Drones can do nice things and are nice toys. But not much in race coverage. I’m sure the Spanish broadcasters wouldn’t show big problems with their equipment in a flat P-R race. But P-R tech guys would show problems in Euskadi’s mountainous region too. But I know it’s easier to blame the Spanish for being too dumb to handle camera bike signals. I find the Sagan situation fascinating. He wins more than most, but not as much as you feel he should. Which is harsh in the extreme but, as you say, the other teams focus on isolating and tiring him out, and the weaknesses of his team is exposed. I can’t decide whether I admire him for doing his own thing and not relying on a team, or whether he’s wasting his best years – with the kind of Quick Step merger you suggest he could clean up. I felt similarly, but I’ve come to the former opinion – it’s a privilege to watch him, so just enjoy it. I’ll remember this Spring campaign for a long time, it was fantastic to witness. I’m going to pack in with the Sagan love-in now though. De Brabantse Pijl was very good yesterday and let’s hope the rest of the season continues as it’s started. A good point – just enjoy Sagan is right. The Green Knight Sagan – yes, I like it. Lefevere as Sagan’s team boss would be fun! A great piece and some thought provoking lines. This year, more than most I have decided that March/April is MY time as it were in the cycling calendar with the number of races across Belgium and France, not forgetting Pays Basque! Fantastic to see Gilbert back to winning ways and looking very happy again now he is away from BoringMC. Been watching pro racing now for over 25 years and the WT means absolutely NOTHING to me. Its races that perk my interest, this Sunday we have another to settle in front of the tv for. An easy statement to make I realise, but the circus of July seems to be waning for me, give me the Spring any time. Agree with above comments, and would like to add that also the Giro offers some fascinating racing almost each year. I anticipate tuning in to Tro Bro Leon this coming Monday for the first time ever, partially in response to the Cycling Podcast’s short piece on the race (and to the comments of many on this blog over the years). I watched some old editions on Youtube and found it compelling. As I watched the ending of last Sunday’s Roubaix, I decided that the image of the race leaders entering the track – the head-on view as seen from the inside of the track – is probably more pregnant with anticipation and drama than any other in the entire cycling calendar. To me, it carries with it the prospect of relieving all of the tension and anticipation not just of the day, but of the whole cobbled season since the Omloop. The Champs Elysees is certainly something to look forward to – but the racing that day is usually a post-script at the end of a novel whose plot has already reached a conclusion. There is a certain irony in much of the best of road cycling taking place not on roads but on cobbles, on sterrata, and even on dirt tracks (as at Tro Bro). But this may simply be because this racing is “different”, which is really not ironic at all. TdF stages from flag to finish….. with Kirby 😱😤 they need to mix up the commies.. seriously the TdF is bad enough without that. Guess I “don’t care” then. I don’t think smaller teams will help – if I was the king of cycling and we had to have (which is very much in doubt) a WT it would be limited to 12 top-tier teams. These teams would be required to have a mix of riders to be competitive in all WT events, not squads just for GT’s or Monuments. The race promoters could also add 6 teams of interest. 18 teams of 9 is more than enough for a reasonable peloton and let’s face it – at any given race there are probably less than 18 squads who really have any chance to make any difference in the racing anyway – regardless of their size. If you have 7 riders per team instead of 9, it might reduce the ease with which the stronger teams can line out the race behind their train day after day. – How can you enforce that, though? You can make a team turn up for Paris-Roubaix, but you can’t stop their riders from pulling to a halt after 90km if they want to do that. Also, a team could have a strong group of one-day riders and say that Jurgen Van den Broeck is their GT rider – and how could the authorities say ‘No, he isn’t good enough’? Forcing riders to do races won’t work – and what’s the benefit of seeing Contador do Paris-Roubaix? Like others, the WT means nothing to me. I don’t need a ‘season-long narrative’ and it can never be a genuine one – how do you compare winning the Giro with winning the Ronde: it’s apples and eggs. I simply don’t believe a smaller team will make much difference. Perhaps Gabriele can come up with empirical data to support or diss the idea? I think it would be possible for the authorities to examine the roster before handing out one of just a dozen top-tier spots. A pure-classics team without anyone capable of riding for GC in a GT might not get in – but could always depend on getting one of the 6 promoter’s choice invites. Contador at P-R against Nibali, Froome and Quintana? Who wouldn’t want to see that? It wasn’t THAT long ago that LeMond, Kelly, Hinault, etc. were battling across the pave – even Hampsten gave-it-a-go….some would call that period one of cycling’s golden eras. I’d like to see them try smaller teams – see if it works. A team like Sky would just hire a JVDB purely for the purpose of being their ‘GT rider’ in the classics. There are just too many ways round it – and you’d always send a domestique. I’d like to see a return to that era too, but I think it’s now impossible. And Nibali aside, you wouldn’t see those riders at P-R: assuming they even completed the first 200km they’d be so far back the cameras would never be on them. I’d like to see smaller teams in the GTs – maybe as low as 7. I’m sure it would level the playing field somewhat, so the superteams wouldn’t be able to *totally* dominate. Agree with Larry T, WT (if it needs to exist at all) should be maybe the top 10 or 12, and many more wildcard team choices for the race organisers. Yet another great Inrng-ism: ‘… it would have come with more buts than ashtray.’ Wonderful! Absolutely love it. There’s a “t” missing, so inrng skips the “an” too. Is that the model with fridge and microwave? Yes but as you say, it might need an extra line in the stage previews to suggest whether watching the opening hour will be worth it. Sometimes the aggressiveness of the early racing is fun to watch how it evolves. Not always easy to pick what days this might happen as there are many variables. I can see days where the best viewing will be the opening and closing half hour. There is something to be said about a hot summer in France, Italy or Spain. Much like a trilogy we can marvel as each drama unfolds – where a rider can hit rock-bottom one day, and then finding winning form the next. I dare say, once the dust settles on the Classics, we will yearn for the summer of wheels. As there are rituals and expectations aplenty. At the same time, we are presently still in spring – and isn’t it a great season to be riding (feeling alive again), then getting home to watch one-day racing? I think INRNG may have shared this before: the Classics are so unlike stage racing, where you often have to pace yourself over 3 weeks. If you want to win in a Classic, you have to go all out. You can’t hold anything back. Thank you for sharing your thoughts, INRNG. Just a mere look at GvA’s results and comparing them to Sagan should convince someone that riding “all against one” was applied to a wrong candidate. Especially “Quick Step against Sagan” allowed Greg to win one classics after another – of course he is in a great form, but without that stupid / blind attitude he would not dominate so much. Let us see what happens in Amstel, will he be still under radar without Sagan? That’s quite not true. Gilbert was cooperating with GvA in E3, only to be beaten in the sprint but can you blame him? Phil is rather quick to line himself so why not give it a go? In G-W the shennaningans which led to Keukeleire and GVA getting away were provoked by the clashing egos of Sagan and Terpstra rather than as a result of a deliberate team tactic. Later on both Sagan and GVA were taken guard by the QS move on the Muur van Geraardsbergen in RVV. By the time Styby was in front with GVA on the road to the Vélodrome he was obviously not cooperating, provoking one of the very few instances this spring wher GVA was visibly annoyed. (or pretending to be) earlier in the race Trentin buried himself to make sure the gap to GVA, distanced by a mechanical, would remain as large as possible. But by then QS themself had already lost 2 important riders through mecanials: Lampaert and Terpstra so eventually GVA got back without depleting all his domestiques and personal reserves and Oss squeezed out the ride of his life to set GVA up for the win. I have following the Paris Robaix for close to 40 years. As an US amateur rider in Europe (France) I rode some races that had cobbles, a long time ago, but back then many towns and backroads had lots of cobbled streets and roads that have now long been paved over. Riding cobbles from the 60’s to the 80’s were hard to avoid in most road races in Brittany and Normandy as well as Northern France, now they are hard to find. Its an art form that many amateur riders outside the Benelux countries, have lost. If you didn’t notice, there were more Chinese than Americans in this years P-R!, Despite having three US registered WT teams in the race, because none of the US’s World Tour Teams, , have bothered to bring aboard the new US riders who might do well in the Classics or the cobbled roads of Northern Europe. All three of the US World Tour teams have, as their main sponsor, American or American-European Bicycle manufacturers. The aim of these sponsors is to sell bikes in Europe, to European consumers, and maybe by extension, to some US consumers. . Despite this, I think the race has lost some appeal to some. You are never going to get consistent coverage of this great event in the US, the behemoth of sports media, on a wide basis, if you have NO American Riders. I am not to old to remember announcers on the back of motorbikes giving radio commentary, their voices stuttering as the motorbike shook on the cobbles. Now we have most of the announcers in small trailers at the finish looking at the Tv screen , or most likely, in a studio in London or Paris, feeding us commentary, between cups of coffee. EuroSport has almost no on-site reporters, relying on pool reporters to fill them in, or worse, their own announcers, squirreled away in some cubicle making wild assumptions. I can understand a little Dutch, and a bit of French, so I try and find those streams as they are ever so more helpful, but for me, its always been that way. Do not depend on US sports media or sponsors, or English commentary. Do BMC, Cannondale and Trek really sell more bikes or more road bikes in Europe than in the US? Does it really matter to European customers whether the succesful riders in those teams are European or American as long as they are succesful? Your opinion strikes me as very much odds with the accepted wisdom that it is easier for a US rider than a European rider to secure a contract in any team with a sponsor that has any interest in the US market. Could you name some US riders who could conceivably have done well in the classics and the cobbles but did not manage to find a team despite trying? As far as career choices are concerned, is it not possible that for a rider of a certain level and age it is both more financially rewarding and secure to ride in a US pro conti team than in Europe? I.e. if you are not very young, aspiring for the top and willing to pay your dues or to simply have the experience of being a pro in Europe, you would at least think twice before booking the air ticket? Live coverage, beginning to end of each stage of the TdF will be a net good. Watching from start-to-finish makes sense to capture the first hour antics… in P-R was particularly intense with no break sticking and the race very much on from the 1st KM. I’ve never fully understood why they don’t do that more often (the Tour will prove if this works as a format for every stage) – on a flat stage where the break has established and its the usual procession of the peloton giving them 10mins, then reeling them in before the sprint.. there is usually hours of relatively boring footage of nothing happening but the break rolling through and off and the commentary needing to find something to talk about. Perhaps that would’ve been the ideal time to show the initial footage of what happened in the making of the break and how the race had formed on that day, before returning later in the stage to catch the finale? When Sagan wins, he seems to ride his own race from a long distance out. I’m struggling to think of an ideal team to build around him under these circumstances. Bodnar et al have proved worthy lieutenants both in the past and also this season but as we witnessed in MSR, only the elite can keep up with him when he decides to open up the gas.